Substitute Leon Clarke struck a late winner against his former club Sheffield Wednesday as Wolves ended a run of five straight defeats. The striker, 29, sneaked in at the back post to turn a Kevin McDonald delivery past a stranded Keiren Westwood. Rajiv van La Parra missed a glaring first-half chance for Wolves, while Glenn Loovens headed Wednesday's best opening wide. Clarke capitalised and lifted Wolves up to 12th, a place above Wednesday. The Owls appeared to have turned a corner, with victory in their previous two matches offering a reprieve after 11 games without a win. Wolves arrived at Hillsborough having conceded 11 goals in their last three away games - all defeats. And Wednesday - whose manager Stuart Gray was once in caretaker charge at Molineux - went close early on when Stevie May rounded Wolves goalkeeper Carl Ikeme, only for Richard Stearman to clear his shot off the line. Loovens then rose to meet Chris Maguire's corner but headed inches wide and Royston Drenthe went just as close with a sweet volley. Danny Graham, the man later replaced by Clarke, missed a one-on-one chance late in the first half but it is Van La Parra who will breathe a sigh of relief as his glaring miss after Westwood parried an initial Wolves attempt did not cost the visitors dear. May again went close and a game with several good chances looked set to end goalless when Clarke, who played for Wednesday between 2007 and 2010, buried the winner. Maguire fizzed a free-kick narrowly wide as Wednesday pushed to level but their visitors held on for a first away win since 25 October. Sheffield Wednesday head coach Stuart Gray: "Coming off back-to-back wins you couldn't have wished for a better start. We could have been maybe 3-0 up in the first 20 minutes. "But one thing we do know is that a lapse of concentration might cost you, and it did. "The second half was far too open, but when you are on top like we were, you cannot believe that we haven't got a goal." 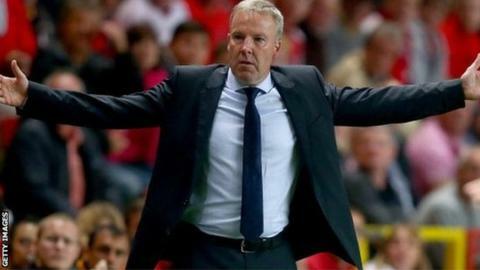 Wolves head coach Kenny Jackett: "My back four did very well today, and so too my goalkeeper although he didn't have much to do. "It was a great game which was end to end. We were able to work their goalkeeper particularly well in the second half, and we came through some tough periods in the game creating some good chances. "We scored a good quality goal from Clarke, so there was some incisiveness there." Match ends, Sheffield Wednesday 0, Wolverhampton Wanderers 1. Second Half ends, Sheffield Wednesday 0, Wolverhampton Wanderers 1. Attempt missed. Chris Maguire (Sheffield Wednesday) right footed shot from outside the box is close, but misses the top right corner from a direct free kick. Delay in match Richard Stearman (Wolverhampton Wanderers) because of an injury. Hand ball by Rajiv van La Parra (Wolverhampton Wanderers). Foul by Tommy Rowe (Wolverhampton Wanderers). Attempt missed. Stevie May (Sheffield Wednesday) right footed shot from the centre of the box is high and wide to the right. Assisted by Kieran Lee. Substitution, Wolverhampton Wanderers. Tommy Rowe replaces Bakary Sako. Substitution, Wolverhampton Wanderers. Jack Price replaces James Henry. Goal! Sheffield Wednesday 0, Wolverhampton Wanderers 1. Leon Clarke (Wolverhampton Wanderers) right footed shot from very close range to the centre of the goal. Assisted by Kevin McDonald with a cross. Substitution, Wolverhampton Wanderers. Leon Clarke replaces Danny Graham. Attempt missed. Royston Drenthe (Sheffield Wednesday) left footed shot from outside the box is close, but misses to the left. Attempt blocked. Caolan Lavery (Sheffield Wednesday) right footed shot from outside the box is blocked. Assisted by Stevie May. Attempt saved. Rajiv van La Parra (Wolverhampton Wanderers) right footed shot from the left side of the six yard box is saved in the centre of the goal. Attempt missed. Kieran Lee (Sheffield Wednesday) right footed shot from the centre of the box is close, but misses to the left. Assisted by Liam Palmer. Corner, Wolverhampton Wanderers. Conceded by Glenn Loovens. Foul by Caolan Lavery (Sheffield Wednesday). Attempt saved. Stevie May (Sheffield Wednesday) right footed shot from outside the box is saved in the centre of the goal. Assisted by Chris Maguire. Attempt blocked. Bakary Sako (Wolverhampton Wanderers) right footed shot from a difficult angle on the left is blocked. Attempt blocked. Bakary Sako (Wolverhampton Wanderers) left footed shot from the left side of the box is blocked. Assisted by Dominic Iorfa. Attempt saved. James Henry (Wolverhampton Wanderers) right footed shot from outside the box is saved in the centre of the goal. Corner, Wolverhampton Wanderers. Conceded by Tom Lees. Corner, Wolverhampton Wanderers. Conceded by Royston Drenthe. Substitution, Sheffield Wednesday. Caolan Lavery replaces Atdhe Nuhiu. Offside, Wolverhampton Wanderers. Bakary Sako tries a through ball, but Rajiv van La Parra is caught offside.